Hello, kiddos! When one is a symphonic metal fan, it is hard work to find an album with a fresh voice, one that does not sound the same as every other soprano or contralto already parading across the spectrum. Because of that, you just cannot help but rejoice when a brilliant, fresh new sound, vocally and musically, comes flying onto the scene on a dragon. Enter Edenwar, a band hailing from Switzerland, Spain, and Mexico. That last one is a little strange for some, but quite exciting for those of us who realize how little of the Mexican music scene we are really exposed to. After a year and a half of hard work and tears, Edenwar brings us their self-titled album. 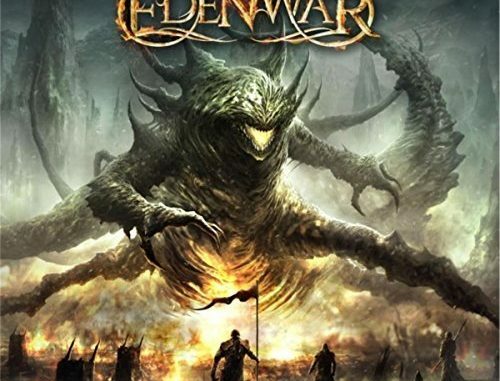 While only boasting the angelic Anna Fiori and devilish Nicholas Dobernak as their main members, Edenwar features eight guest artists as well as a full choir, making it a truly impressive experience. This is by no means a first release for Fiori, whose solo album dropped only two years prior, or Dobernak, who has been involved in music production and composition for the past 15 years. Defining their name and album title, the band states it is a metaphor of a struggling mind attempting to protect an innocent and fragile personal paradise. They use the name as a mantra to keep up the fight. From militaristic marches like “Beyond Eternity” to the almost-lullabies like “Depths of Insanity”, Edenwar’s debut album brings the listener to the front lines of an epic battlefield that spans both fantasy and reality. Anna Fiori’s range is quite amazing and is supported by and paired with an amazing choir (Edenchoir) and guest vocalists Fabio Lione (Angra, Rhapsody of Fire), Harrison Bades (The Distant Fourth), and Mario Infantes. This creates an interesting duality, presented on such tracks as “Out of Me” where, after Fiori’s mystic vocalizations, the bridge is carried by Infante’s growling or on “Depths of Insanity” where Lione and Fiori perform an interweaving duet. There are some prominent time changes throughout the album. They keep the listener on their toes but not in a bad way; just enough to keep your attention. The drum accentuation is perfect, minimal, but they alone don’t bring the battle to the album. The whole team does, making it so varied in style track to track that you cannot help but feel enthralled whilst listening. Slower, more ballad-esque tracks like “Agony of Mankind” and “Lost Dreams” are dispersed among the harder tracks on the album, giving it an excellent ebb and flow overall. Guest guitarists wail some excellent solos, each with their own special flair setting them apart from the others. While all impressive, Christian Vidal of Therion performs a particularly soulful solo on “Save My Life” that sells the desperation of the song. Tim Somers of Delan provided two solos on “Beyond Eternity” and “Lost Dreams” which were by contrast more technical and cold, but just as intriguing. A personal amusement on this album would have to be “Seventh King”. Brief but outstanding, this song may strike a note with another fandom: Lord of the Rings. It starts off with sounds of the battlefield and then builds into war drums and operatic vocalizations, ending with the final words of Boromir, fallen comrade of the Fellowship of the Ring who dies at the end of the movie of the same name. While it is quite surprising, it is an excellent addition and lends to the overall severity of the song in lieu of length. If there was one thing I might wish of the album, it would be longer tracks and a few more of them. The eight tracks provided here are excellent, and one could not ask for better. They showcase the band’s wide range of ability as well as some fantastic guest work. The desire for a longer album is better described as wanting more time with the band. However, that is what a second album is for. Edenwar has given me renewed hope for the Symphonic metal scene, I hope that they provide the listeners with more in the future.